The original article was “advertised” on a number of wargames fora including The Miniatures Page where it attracted a couple of very interesting comments so I thought I’d précis them here for everyone. “When it comes to wargaming I purposely try to not get into the stochastic side of dice roles, even though sometimes it's hard to not think about it. “I started looking at the maths because the way the dice work in FOG is different from DBM and much harder to estimate at a tactical level. The maths has shown me why and I thought the analysis would help others. I particularly like the phrase “When I start calculating probabilities it breaks the immersion” it’s such a clean encapsulation of the fun of wargaming. “When you analyze one outcome, you are correct in that you will see more wild swings with smaller amounts of dice. 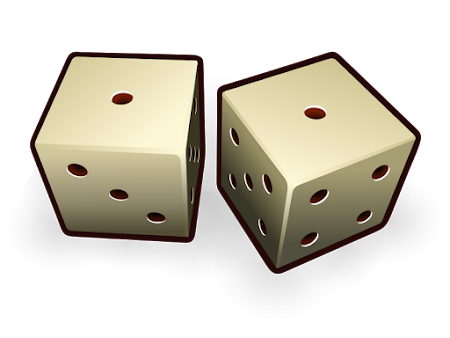 When you test for the same outcome over and over again, your luck will tend to balance itself out as you are adding more and more dice to the equation. Example: you have 3 units of light horse trying to hold a line that might not work out so well for you. [Later specified as three separate] light horse units [against three cavalry units with], for argument's sake, a 30% chance of victory for each individual unit. No unit influences the next as one outcome is independent of [any] other. However, if you look at it in terms of [the] chances that all three will win, then it [is] 0.3 x 0.3 x 0.3 or about a 2.7% … significantly less than the 30%. While it is good to know the statistics, the larger question should always be, "How much damage will be caused should I fail?"" “[3 units of light horse] against 3 units of cavalry [is] just three versions of the 4 v 2 combat at the same odds and nothing changes. Three attempts at (4 vs 2) is not the same as one at (12 vs 6). When you repeatedly test something the odds for each test remain the same whilst the rolling average of all the results combined approaches the statistical average as previous high and low scores counteract one another. However you can't combine the rolls from different combats [in this way] for three reasons; two maths and one FOG related. The FOG reason is that high and low scores coupled with failed cohesion tests for either side will change the number of dice between each round of combat. So you can't repeat the test (or combat) ad infinitum. The maths reason #1 is that, even if things stay the same, each round of combat is an independent event and previous results have no impact on its outcome. The average changes; not the odds for each combat. “There's potential [logic] trap here: a 2.7% chance of the light horse losing all three does not mean there's a 97.3% chance of the cavalry always winning. If the odds of the cavalry winning are 66% which include 33% winning by one and 33% by 2 or more (in rounded odds). The chance of the cavalry winning all three by one, or all three by 2 or more, is the same as the light horse winning: 0.33 x 0.33 x 0.33 = 0.036 [or 3.6%]. [In contrast] the chance of the cavalry winning all three by any score is much better at 0.66 x 0.66 x 0.66 = 0.29 [or 29%]. "“How often will I lose and what happens if I do?" are equally important questions [not just “How often will I lose”]. Or even better "How often will I win and what happens when I do?". A marked contrast to my approach. Feel free to add yours below. I’d like to know if you are a glass half empty or a glass half full wargamer?